Most people, especially those from the underdeveloped and developing nations of the World dreams of traveling to the industrialized Nations of the World, mostly in pursuit of greener pastures or for more exposure to the beauties of technologies in these parts of the World. However, the doors to these countries are not always open to immigrants. This accounts for the reason people sees VISA LOTTERIES as one of the best ways to gain entrance into these countries legally. It’s against this backdrop that this article becomes pertinent; to expose you to all you need to know about Visa Lotteries and how you can take advantage of that. How easy is it to win a visa lottery? Why do people go after visa lotteries? How do i apply for a visa lottery in 2019 ? What would it cost to get a visa lottery? 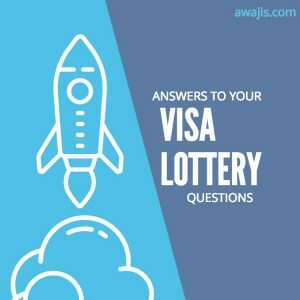 Which countries offer visa lottery? In January 1990, the United States established an Immigration Act which allowed immigrants into the US from countries who have been sending few immigrants into the States. The criteria to winning the American visa lottery is based pure on luck. Every year, over 55,000 people from various countries are given green card visas to work and live in the the United States. Many other countries in North America and Europe has followed the USA’s example to allow foreign nationals earn permanent residency through a visa lottery. The question of how easy it is to win a visa lottery can make sense only as a means of comparison. how do i mean by that ? lets take the case of the United States for instance. Every year, about 55,000 slots are available for Visa lotteries, with millions of people competing for this limited space. Once you have applied, your chances of being selected is relatively high. However, in any case,if you were not selected, you really still don’t have much to lose as the application process was entirely free. However, comparing it with the process of applying for a US residence visa from outside America, which tends to be almost impossible, Winning a Visa Lottery is relatively easier. As was observed above, the doors that leads to the countries of the developed world is not always open to emigrants. This is so because the developed countries tries to block their borders to avoid the over influx of people into their countries, which could possibly affect their economies. Consequently, the process of obtaining visas into these countries appears to be a herculean task, and mostly outside the reach of the ordinary man. ITS EASIER TO OBTAIN: The process of obtaining a normal working visa is so tedious and almost impossible to get, due to the requirements you are expected to meet. That is why you hear stories of a young African boy getting married to a grandma in the US or UK. They just want a green card visa. However, with a Lottery Visa, you automatically become a complete citizen of the issuing country. If you ask me, there is no easier way of becoming a citizen of a country aside through this means. FOR ECONOMIC REASONS: The economic reason account for the major reason many people from the third world countries go after Visa Lotteries. The reason is simply because the poor masses in these areas can not afford the financial cost of emigrating to the highly industrialized nations of the world. Hence, Visa lotteries are almost entirely free, which makes it a win win for the applicants, even it they were not selected, they still have nothing to lose. please, the above link is the only official link for the US Visa Lottery Application. open the link and follow the simple instructions there. Aside this, you can also visit US Embassy in your country, from there, you can request for the visa lottery form, fill the form and submit it back. This same rule for applying for US lottery Visa also applies to the Visa Lotteries of Other Countries. You can visit the countries official website online to apply for the Visa Lottery or visit their Embassies in your country to apply from there. A lot of persons are misinformed about the financial cost of applying for a visa lottery. Truly, it doesn’t cost anything to apply for the visa lottery as the application process is entire free. The only cost you’ll incur is the cost of taking some passport photographs and maybe printing the form, that’s if you don’t have a printer at home. If your visa lottery application is successful, you’ll get invited for an interview. For some countries like the United States you’ll be required to pay a non-refundable fee of about $330. This fee varies for various US embassies. You’ll also need to get a six-month old international passport. This cost money too. Avoid those cheap scammers who promise to help you win a visa lottery for a specific fee. They have no authority to do that, even if they work right in the embassy. We’ll end with this list of countries that offer visa lottery.